The morning after our recent presidential election, I gathered with students and colleagues in New England Conservatory's Department of Contemporary Improvisation for a production meeting. We had a concert coming up in less than a week, and we needed to finalize some staging details...except that none of us was able to focus on music at the moment. New England Conservatory has an enrollment of 750 graduate and undergraduate college students from 46 states and 39 countries. In the CI department, our 80 or so students and faculty hail from different parts of the US, Canada, Central & South America, Turkey, Israel, Syria, Korea, China, Japan, India, Germany, Iran, and Armenia, with backgrounds in jazz, rock, classical, free improvisation, and folk genres. We are composers, performers, improvisers, singers, dancers, and instrumentalists. We are a community of individuals with different needs, differing perspectives on the world, and different political affiliations and opinions. And we come together on a daily basis to study, create, discuss, analyze, and hone our practice as artists and musicians. The morning after the election the NEC community, just like the rest of America, was experiencing a mix of emotions that badly needed voicing. Most worrisome was the sudden awareness of a rift, perhaps one that had always existed but that had gone unnoticed as we collaborated in our areas of common interest. We were all very much aware of a need to communicate across that rift, to make sure that we could co-exist in spite of our differences. But how best to do that? As producer of our fall department concert, I had originally intended to focus on the music of the great American country singer George Jones. But as the summer unfolded, with the increasing surrealism of an incredibly hostile and polarizing election season combined with a rise in vigilante law and random acts of violence, as well as the appalling anniversary of 15 years of war in Afghanistan, I found myself compelled to ask who we really are, the people that make up these United States of America, and what our music might be. In August, I changed the program title to America? America! The program was never intended to be about politics. Instead, I wanted us to take a deep look at the music of the United States. Everyone has some defining concept of American music. Depending on one's listening preferences, that might range from Aaron Copland to John Coltrane to Beyoncé to Joni Mitchell or the Foggy Mountain Breakdown. For this project, I asked our students and faculty to bring in their concepts of quintessential American music, to look for the inherent American-ness in it, and, in doing so, to explore issues that have played a role in the development of our national cultural identity. The result provided a fascinating, (though certainly not comprehensive), window into this country's musical self through the perspective of our community. We ended up with music from traditional southern folk to country, blues, early gospel, R&B, classical works, a factory song representing immigrant communities in Industrial Era New York, pop, and jazz. There were excellent covers of existing works, as well as conceptual performances that dealt with issues of consumerist feminism, musical appropriation, stereotypical perceptions of the Midwest, and the ongoing struggle for racial equality. Particularly striking was a haunting performance of Strange Fruit, performed a cappella on a dimly lit stage, and Survivors Breakfast's rendition of Ballad for Americans, which took the Popular Front era operatic folk cantata, with its dream of "American Exceptionalism and the Melting Pot," to new heights. Each piece could be appreciated in and of itself, or, looking deeper, as a part of a larger portrayal of our entire country, from north to south and east to west. In the days between the election and the concert we met several times as a department to discuss how we could best acknowledge the striking changes sweeping the nation. In the end, we decided that our strength in that moment lay in speaking through the music we had prepared, celebrating America in its entirety. It was an incredible night. Talking with audience members afterwards, it was clear that the concert provided much-needed relief after the events of the week. In an audience packed with so many different kinds of people there was a sense of unity, of peace, of gratitude - here, at least, was a space where we could all gather together. As artists, we often feel a great weight of responsibility to respond in the face of change. While there is absolutely no doubt that art is a powerful tool for the purposes of protest, equally important is the role of art in bringing people together, communicating across great divides. Protests and rallies are important. Recognizing our weaknesses and our challenges is essential. But it is also important for us to come together in spite of our differences, to listen, to be moved, and to be together as a community. In this way, music can indeed be a powerful catalyst for change, working to bring people together across divisions of fear and misunderstanding. Deep as our valleys, high as our mountains, strong as the people who made it. For I have always believed it, and I believe it now, and now you know who I am. To listen to the concert, click here. 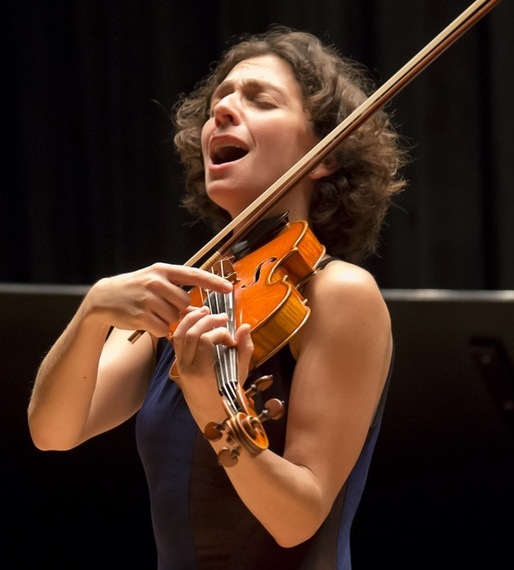 Eden MacAdam-Somer is one of the most exciting and versatile young musicians performing today. Hailed by the New York Times as reflecting "astonishing virtuosity and raw expression," her music transcends genre through soaring violin, sweet vocals, and percussive dance, weaving in and out of the many cultures that have formed her experience. Her travels have carried her across the continental United States, Alaska, Hawaii, to India, Iceland, Israel, and the UK. 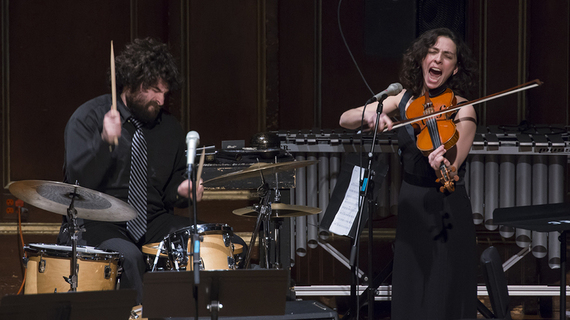 Eden is a full-time faculty member at New England Conservatory, where she teaches improvisation and serves as Co-Chair of the Department of Contemporary Improvisation. She also makes frequent visits to Kabul, Afghanistan, where she works with young Afghan musicians as guest faculty member at the Afghanistan National Institute of Music and collaborates with local artists. Outside of the classroom, she maintains an active international performance and recording career as a soloist and with such bands as Notorious Folk and the Klezmer Conservatory Band. Her solo album, My First Love Story was listed as one of the top ten jazz albums of 2015 in the Boston Globe, and features live solo performances on voice, violin, and percussive dance. Click here for more information about Eden.